Come & Visit us in store! Open 6 days each week & with 2 late nights, our staff are ready to welcome you to our boutique. 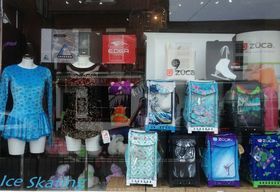 With parking just a 3-4 minute walk away, large changing rooms with ornate mirrors, a separate boot and blade shop and bag boutique and vast array of gorgeous skate wear and accessories, take your time and browse, try on in relaxed and unhurried surroundings, select gifts for your skate friends and family and have a chat with our lovely and knowledgeable staff.